Note: This sheet is 1/144 scale for the Minicraft kit. 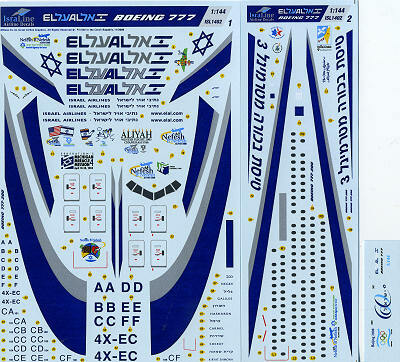 This is the first airliner sheet I've seen from Isradecal and it is apparently #2 in their IsraLine series. 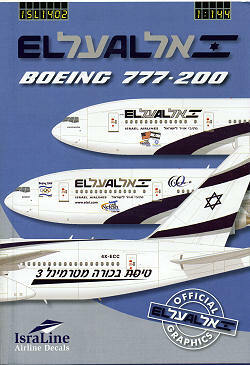 Not surprisingly, it is for Boeing 777-200s from El Al, Israel's national airliner. These planes have white fuselages, engine cowlings and tails with Boeing Grey wings and tailplanes. What IsraLine provides are the very nice blue and silver markings carried by the airline as well as the various registration marks and aircraft names. El Al flies sixe of these planes, all pretty much the same in terms of colors. What is different is the names of the planes, which have changed on some airframes, as well as some special markings that were applied to the nose just behind and below the port forward entrance door. The sheets included provide all these various markings. The full color instruction sheet indicates exactly which aircraft had which name at which time and which carried which of the special markings, so no worries about getting any of them mixed up. As usual, the instructions are superbly researched for accuracy.The decals themselves are superbly printed in the Czech Republic and are completely free of any registration glitches. You now have world class decals and world class references; what more could you ask? Review sheet courtesy of and available from various retailers around the world as well as direct from their website (click on the logo).